When I saw Linda Marveng’s Milanese Shawl in her May 11 post, my fingers itched to knit it. (The pattern is available both in her book TO RETT EN VRANG and at Ravelry. I had a long road trip coming up, I rationalized, and this would be the perfect project to bring. Committed to knitting the Milanese Shawl and ignoring my nearly overflowing large chest stuffed with skeins of wonderful yarns, the next day I ordered 3 skeins of Anzula’s “Cloud” (100g=575y=525m). Cloud is 80% superwash merino, 10% cashmere and 10% nylon. I find the blend curious. When a wool is chemically treated to be superwash, the wool is weakened, which may explain the 10% nylon in “Cloud.” I would have gone with an 80/20 or 90/10 blend of merino and cashmere. Perhaps the makers wanted this yarn to be used for socks, but then why not leave out the cashmere (a soft fiber) and instead use an 80/20 or 90/10 blend of merino and nylon? Today I leave to attend the Black Sheep Gathering in Eugene, Oregon. On the way up (north), we will be driving by Ashland, Oregon, home of one of my favorite fiber stores, The Websters … which, coincidentally, happens to have an amazing button collection. And the Milanese Shawl needs 8 buttons. Hmmm. 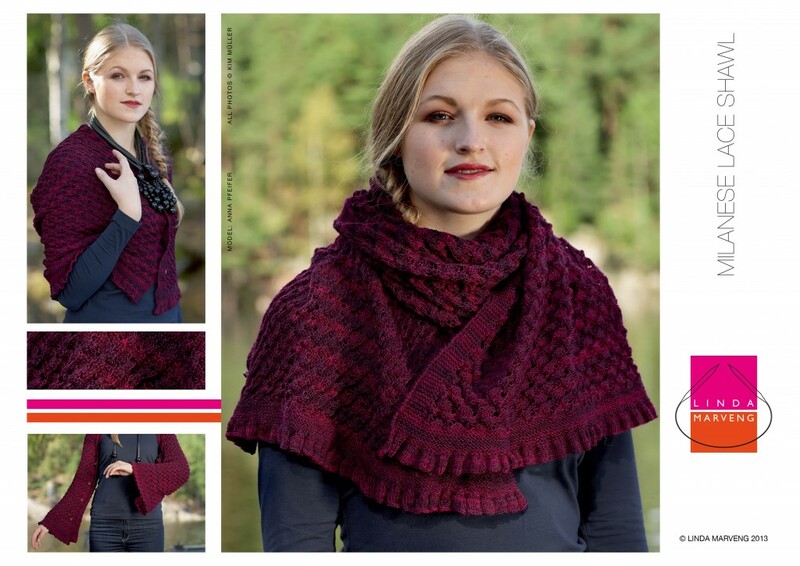 This entry was posted in Knitting and tagged Linda Marveng, Milanese Shawl, To vrett en vrang, Webster's. Bookmark the permalink. Marvelous! I am so pleased you like how it looks knitted up! Me too! Several of Linda’s designs utilize a multi-use approach! I am looking forward to seeing it finished though am greatly enjoying the journey there! I love using the art of a skilled hand dyer! I have knit several inches … It is looking great! I love the versatility of that shawl! The shawl is lovely, and what a wonderful colour too! Oh, I am thrilled that you are posting about my Milanese Shawl! Thank you so much for your marvelous description of my designs and links! 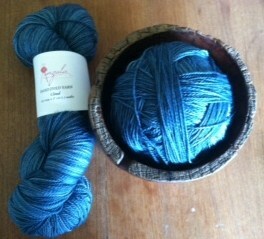 I am so happy you chose Anzula’s Cloud and so look forward to seeing it knitted up! I do agree that is an unusual mix of fibers, but it does look stunning!